There are a lot of nice movies that you can watch at the online video streaming site. You can only watch the movies online as the site does not provide you with any option to download the videos. Even though it doesn’t provide any option for you to download the video, you can use a Streaming Video Recorder like Movavi Screen Capture Studio available for Windows and macOS powered Computers and Laptops. How to Record Live Streaming Videos Online on Windows & macOS? The first step is to download Movavi Screen Capture Studio and install it on your PC. It is a very light screen recorder so it should not occupy much space on the hard drive. Installing the software is easy and you just have to keep clicking next to complete the installation. Once the software is installed, you have to activate it with the license key. The activation process of the software is smooth without any lag. Movavi Screen Capture Studio allows you to adjust a rectangle frame to determine which part of the screen you want to record. After launching the software, you must go to the video page and press the play button. Next, you must set the rectangle frame over the area of the screen where the video is played. If you set the video to play in full screen, you can select full screen from the capture area drop down menu to capture the video in full screen. You must make sure both of your speakers are plugged into the correct audio output port on your desktop. After turning on the speakers, make sure to test and see if your speaker is working like you expected. You will have to select the audio option on the control panel to enable the software to record the sound output from the speaker. When you are ready, you simply hit the Rec button to start the recording session of your favorite movie. You can use the timer function to automatically stop the recording session if you don’t want to have to manually press the stop button when the video ends. If you are wondering how big the screen recording video file will be, you can take a look at the control panel as the size of the video is shown in real time as it records for a longer and longer period. It also show how much size your hard disk has after saving the video. Movavi streaming video recorder uses an advanced compression technology to compress the video so that the size of the output video will be smaller. Many free recorder's use lousy compression technology which results in the video being too large even just for a short video length. The quality of the video is good even after the compression. It compresses the video while it is being recorded so that the video can be easily saved in a smaller file when you export it. You can have the video uploaded directly onto online video sharing sites such as Vimeo, Dailymotion, Amazon S3, YouTube and Facebook. You can light up your cursor to get your audience to notice it. The screen recorded video will be clear, crisp and HD quality. You get to play back the video after the screen recording session is stopped. You can use the built in video editor to edit the video if you spot any part that you don’t want in the video during the playback. The scissor tool is the tool you should select when you want to clip the video and get rid of parts that you don’t want to appear in it. The volume of people talking or background sound in the video can be adjusted in the video editor. Features like crop, rotate and magic enhancement will be available in the video editor in Movavi Screen Capture Studio. In exporting the video to your desktop, it supports formats compatible for online video sharing as well as formats for viewing on mobile devices. You can record the input of the sound from a speaker or microphone or both at the same time, because it allows you to record your voiceover, and it’s also suitable for those who are looking for a software that can record podcast for the purpose of creating an audio book. Movavi does provide some basic tutorials on how to use the features of the screen recorder software. Tooltips will appear when you first launch the software so that you can find your way around the features on the interface. 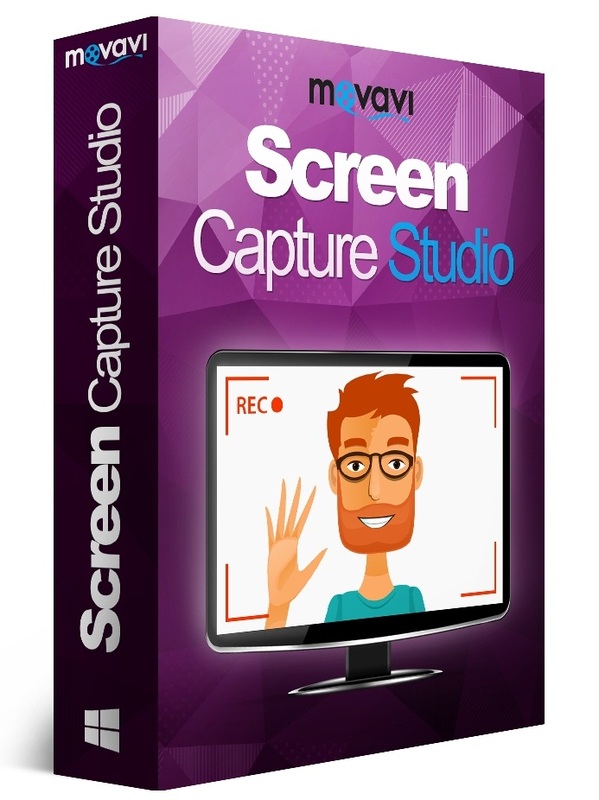 Movavi Screen Capture Studio can also be used to record a face to face video with the use of a webcam. To record a video with your webcam, you should click on the Record Video button on the welcome screen. Movavi Screen Capture Studios comes with a few sample audio tracks and video files that you can use for free in your video. The interface is incredibly user friendly with every tools you need arranged in an organized way in the interface.